Airtel, the largest Telecom Operator in India announced it’s quarterly results for the second quarter ending September 20th, 2013. Their results are a clear indication that mobile internet will bring the next wave of revenue growth for telecom operators in India. Operators in India have long struggled with wafer thin margins, thanks to extremely low voice call rates. In addition to this, TRAI in recent times have bought slew of policy changes, that have come as a cropper to Operators’ VAS revenues. On the other hand, rise of mobile internet usage comes as a much needed fillip for operators to push their bottom lines. The graph below gives the complete picture of Airtel customers’ mobile internet usage. 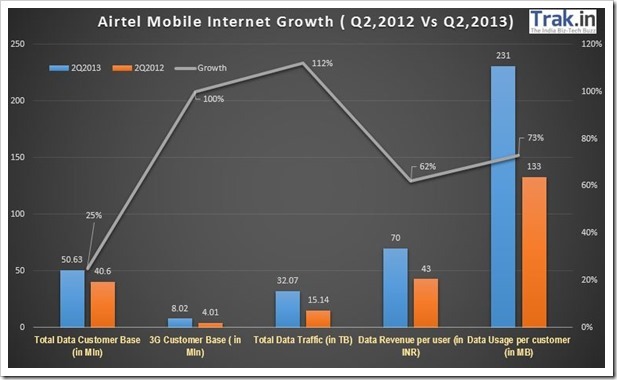 The interesting and probably the most heartening thing to see in the graph above is growth in data usage per customer. It has grown from average of 133 mb per user in 2nd quarter of last year to nearly 231 mb in corresponding quarter of this year, a good 73 percent rise. Another aspect is the steep rise in 3G adoption. While the overall data customer base increased by about 25 percent, the 3G customer base doubled from 4.01 million users to 8.02 million this year! The consumption of mobile data by customers over Airtel network more than doubled from 15.14 Terabyte last year to over 32 Terabyte this year. Right now roughly about 17 percent of data users are 3G users on Airtel network. Given the rise of smartphones and falling 3G rates, this number should easily double or even triple in next 12 to 18 months which should significantly improve data revenues as well. Currently mobile internet revenues of about INR 15000 crore, is less than 10 percent of the total revenue pie (INR 21,324 crore). However, given the way mobile data usage is growing, the scenario is expected to change drastically over coming years. Africa net revenues (USD terms) up 5.6% Q-o-Q and 6.2% Y-o-Y.